The two men at the center of a racially charged shooting in South Carolina that's getting national attention, where a white police officer fatally shot an unarmed black man, are Coast Guard veterans. The white police officer and the victim involved in the shooting of an unarmed black man in South Carolina on April 4 are Coast Guard veterans, officials have confirmed. 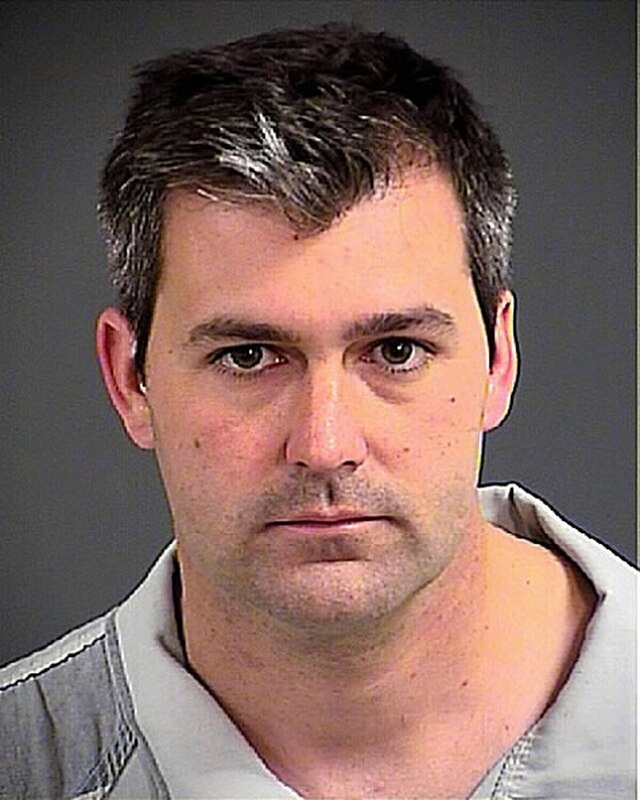 North Charleston police officer Michael T. Slager, 33, and the unarmed black man he shot following a routine traffic stop, 50-year-old Walter L. Scott, served as junior enlisted Coast Guardsmen earlier in their lives, according to service records provided to Navy Times. A recording taken by a bystander shows Slager firing eight times at Scott's back, hitting him five times, as he tries to flee during the officer in the April 4 encounter. Slager was charged with murder Tuesday, said North Charleston Mayor Keith Summey at confirmed in a press conference, after the video emerged. surfaced of him shooting the unarmed Scott multiple times as he tried to flee arrest. Following the shooting Saturday, Slager told officials that Scott had wrestled the officer's stun gun away as he pursued him for a traffic stop. Scott had an outstanding arrest warrant for unpaid child support, officials said, and he ran away when Slager pulled him over for a busted taillight. A video taken by a witness, which surfaced Monday, shows the two apparently tussling as an object falls to the ground. Slager then draws his weapon and shoots Scott eightmultiple times in the back. After handcuffing the body, Slager goes back over to the object, picks it up and then drops it near Scott's body. Slager made a "bad decision," Summey said at the a during a news conference that leading to the murder charge. Slager was being held without bail at the county detention center Wednesday. Personnel records show that Slager served in the Coast Guard from 2003 to 2009, last serving at Station Cape Canaveral, Florida, as an unrated fireman before his honorable discharge. His service record is very unusual as most enlisted members qualify for a rating within a few years of service and move up the petty officer ranks, a retired Coast Guard captainO-6 told Navy Times. The Coast Guard is known for long wait times for "A" school, retired Capt. Jim Howe said, but six years is highly unlikely. "It's possible he got rated and then through nonjudicial punishment or courts-martial was reduced in rate back to E-3, but that is just speculation," he said. The Coast Guard was unable to provide a full record of his dates of rank, awards and duty stations on Thursday. It's also possible that he was on a long wait-list for "A" school and then had some sort of medical setback that kept him from professional training, Howe said. "Very curious, if you ask me," Howe added. Scott received a general discharge under honorable conditions stemming from a drug charge in 1986. He served two years and was last stationed at Coast Guard Yard in Baltimore, Maryland as an unrated fireman apprentice. The Coast Guard declined to provide further details of their service.